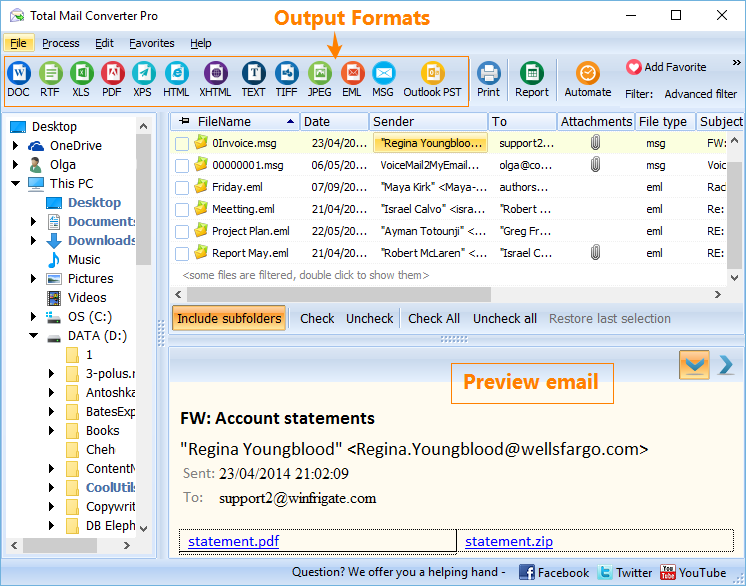 Total Mail Converter Pro converts EML and MSG files and attachments to PDF. 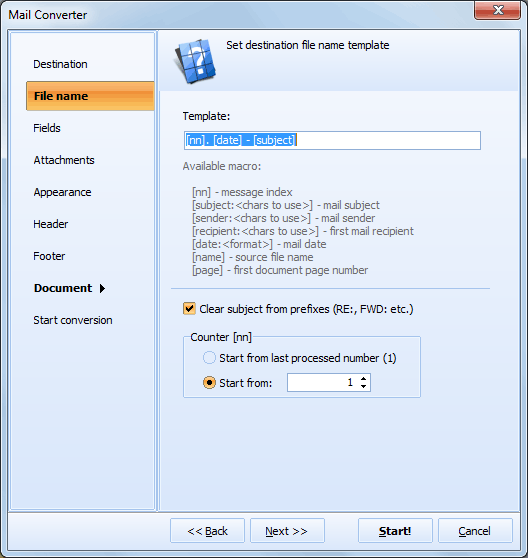 The most exciting thing about this converter is an opportunity to convert a large group of emails in batch. However, no one wants to get a bunch on PDF files with alike 00020121.pdf names. That's why we have added a renamer to the program. Using it you can rename your emails using macros and give attachments descriptive names. For example, you can add the sender or the subject to the file name. Naming the output files is very easy. You can either use the default file naming mode or apply your own pattern. 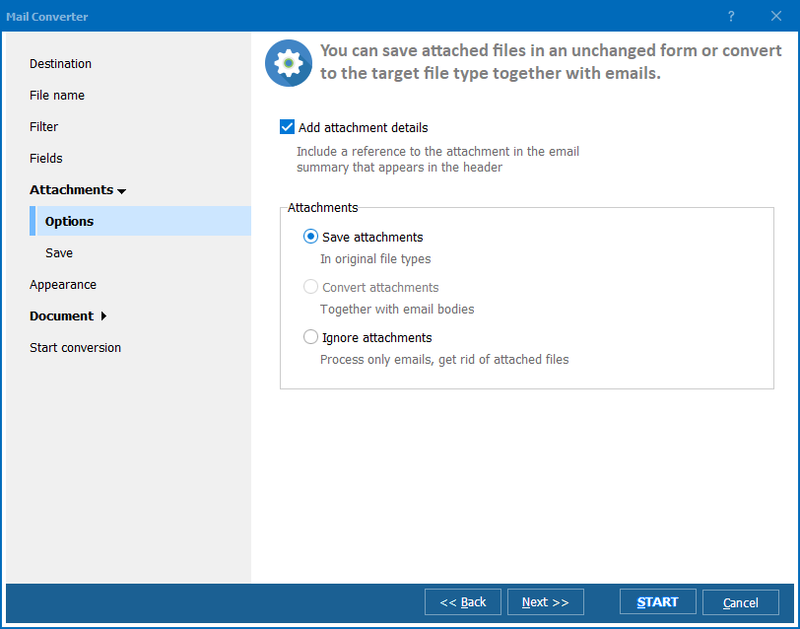 Select the right folder in the file tree and view the list of EML/MSG files with checkboxes. Check the files selectively or press "Check all" to check the entire list. Select PDF in the toolbar. Choose destination for your output files. 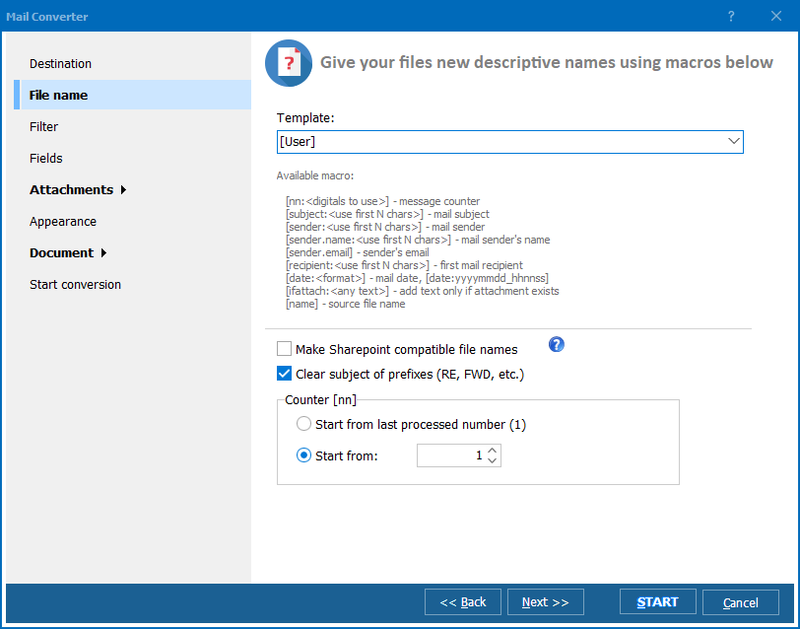 Open the "File name" tab and modify the file name template using your preferred macros. In the template field you can see the default pattern. To change it, add/remove elements according to your individual preferences. Also, you can add/remove any macro. Check/uncheck the "Clear subject from prefixes" option and use your preferred counter mode. Specify "Fields", which you want to include in your output files. View options available in the "Attachments" tab and apply them if necessary. Other options include Appearance, Header/Footer and Document, which you can use to shape your output files. Select "Start Conversion" to run through your selection once again. Press the "Start!" button to launch conversion. As you have seen from the video, this is very easy. 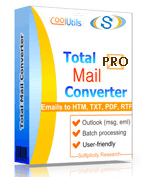 Total Mail Convert Pro can be operated in a non-GUI mode via command line. Download the 30-day free version and enjoy the process!